As you already know, we have a huge amount of beetle-kill on our land. 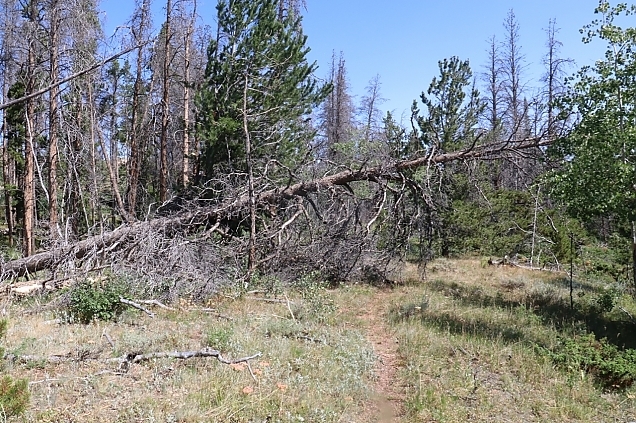 It's sad when another once-beautiful stately pine gives up and succumbs to gravity. Last week we came home from being in town and I looked out the window and the view just didn't look right. I said to Rick, that tree wasn't down before was it? No, it wasn't and it's a biggun. But at least the trees that are dead and eventually fall will go on to keep us warm and cozy in the winter. 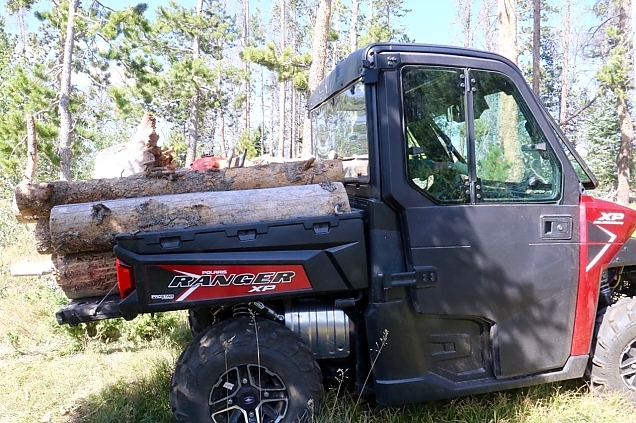 Gathering wood is essential to our lifestyle, and it also keeps the ground clear of fallen trees. Here Hailey demonstrates where the tree is in regards to the cabin. 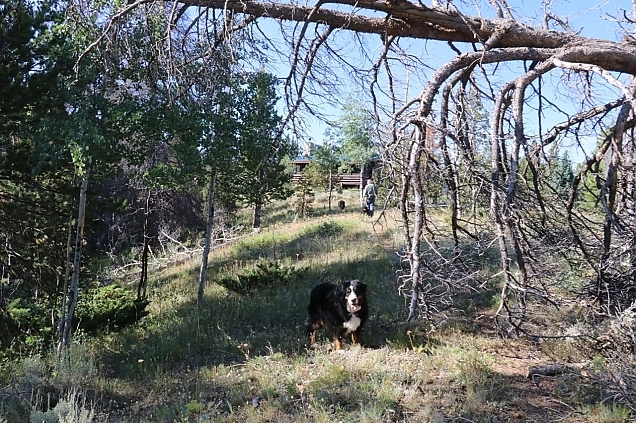 I think we are leaving the tree right where it is for now and we have plans for how to use it —maybe a sign for our new (yet to be done) gate post? Maybe some furniture? Two people close by have a sawmill that would make quick work of it. And, the wood is so lovely. 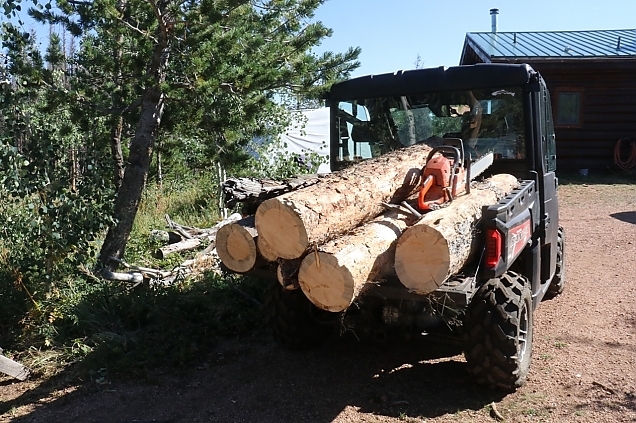 We still have a huge stack of logs from the cutting of the trees in the meadow that are close to the cabin. 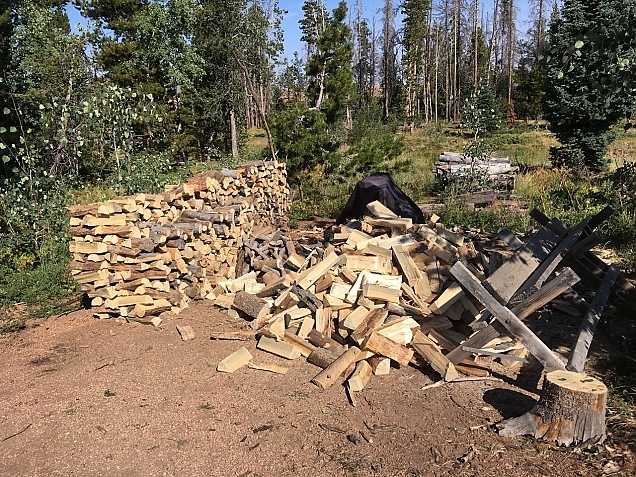 We decided that instead of taking the easy way out and using that stack we would go further into the meadow and harvest from there for now since in winter it will be covered in snow and unreachable. 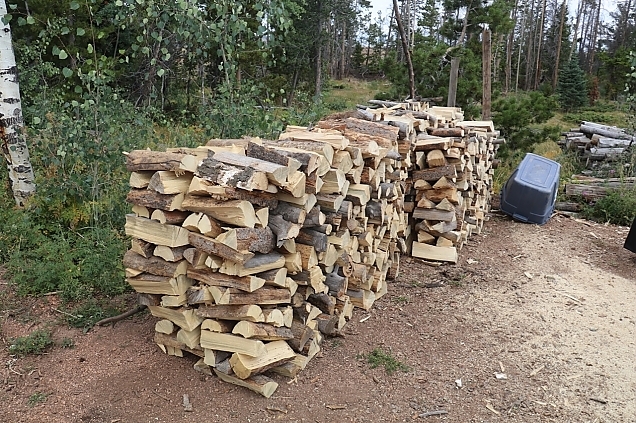 Better to save the close-in wood for a winter emergency stash. We also need to get the darned wood shed built, and now that our propane generator is delivered and in place we'll soon be able to start on it once the propane tank is delivered, which we are hoping won't be too long from now. We posted a week or so ago about putting up wood and here is how it looked then. I thought you might be interested in seeing the steps that go into that nice neat stack of wood. Well, okay, I admit it's not as neat as I would like it. It kind of leans and takes a turn in the middle. But, hey. This is a load of logs that we cut down in the bottom of our property from a large tree that had fallen over years ago and also what was left of two trees that were leaning over the road that our neighbor Mark (who owns land above us) cut down. We told him he could have the wood if he wanted it, and then he left us a couple of logs. 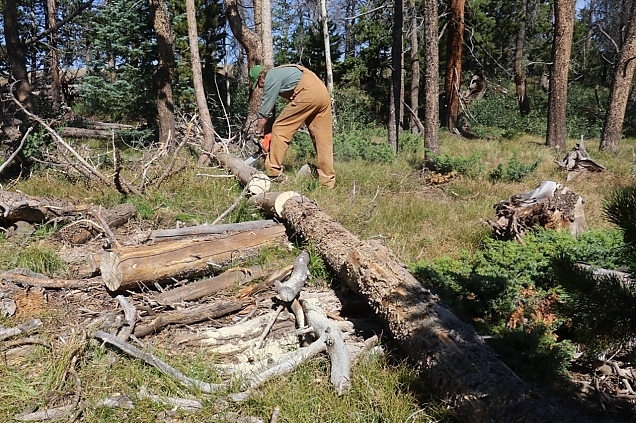 Here is Rick sectioning out a large tree (already fallen) into logs out in the meadow. Our bounty from the meadow loaded up into MM (Mountain Mia, as we call our Ranger). Again, some pretty hefty logs! Next comes the smaller sectioning of logs in prepartion for the splitter. 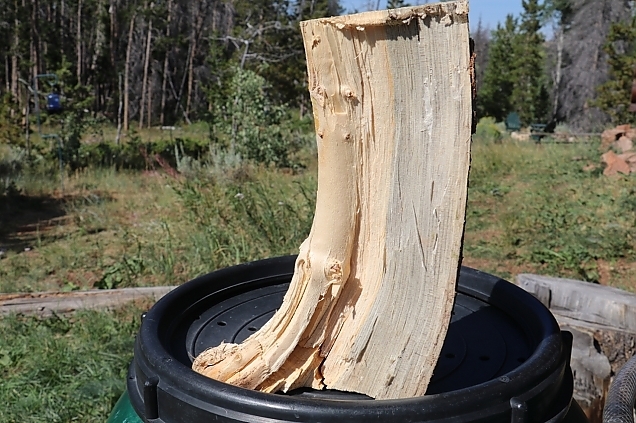 We cut the log lengths into smaller segments that will fit into our wood stove. Longer pieces can be burned in the fireplace. It's a messy process and the reason why we wear overalls when doing this part—sawdust everywhere! Rick runs the saw and I push the log into place for him with each cut. Next comes the fun part — the splitting! Having the splitter makes it so easy. 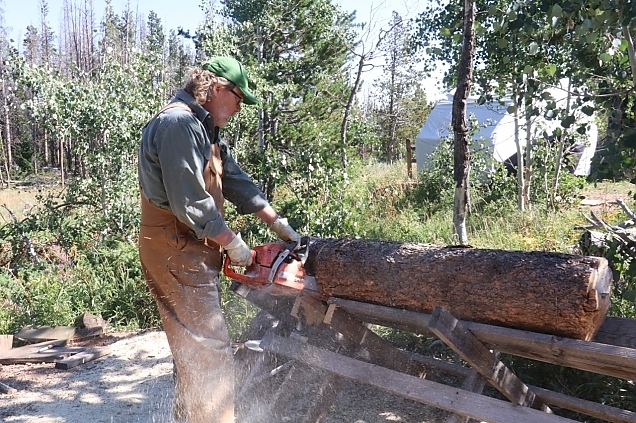 Some of the bigger logs need to be cut into six or eight pieces, depending on the size of the tree. Make a split, put it back on, split it again! This one I think we ended up splitting six ways. I love running the splitter, but sometimes I load the logs onto the splitter and Rick splits. Either way, with two people working the time passes quickly and pretty soon you have a wonderful piney-smelling big stack of lovely split wood! (see next photo). Here is all the wood after it's been split. It's not only fun (well, I think so) but a good workout for the abs and everything else. Plus, you get to see and feel the wood up close. All this wood is beetle kill which gives it layers of blue-ish-gray rings. When it's cut into lumber it makes cool stripes. We found all kinds of funny things inside the trees marking-wise. Some had a yellow laquer and funny holes. 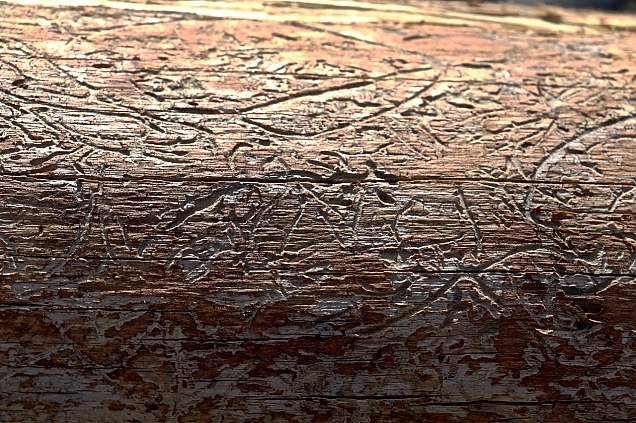 Some bark had what I like to call "ancient tree writing" on it, which I think are just simply bug tracks. It looks like tree hieroglyphics to me. And some pieces just had ants. Tons of red ants, some of which ran down into my overalls biting at my tender flesh. Damn things. Sometimes I see wood that I want to keep which drives Rick crazy. I have a pair of "boots" that I use as bookends. 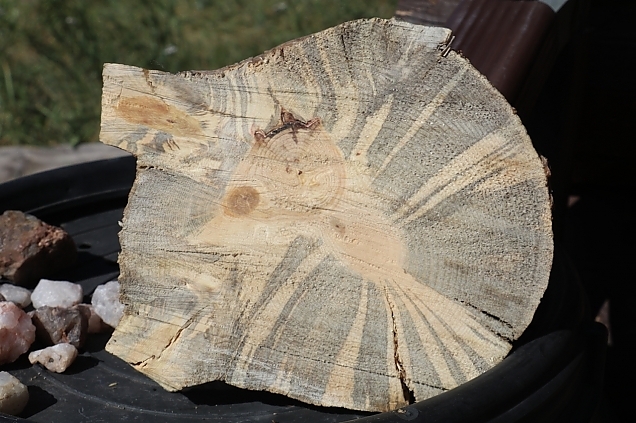 I also kept this slab of wood because this tree had two hearts and a beautiful beetle pattern. Rick is going to sand it down for me and then I think I will shellac it and display it. Another find of mine from this batch of wood, is this single boot. I liked it because it does look like a cowboy boot and the heart of the tree is so lovely and round on the front of the boot. After all the gathering, sectioning and splitting comes the stacking. Of course. Here is our finished stack of wood which is about a cord and half, with another 2/3 cord on the front porch. Yes, it does seem like ALOT of work, doesn't it? 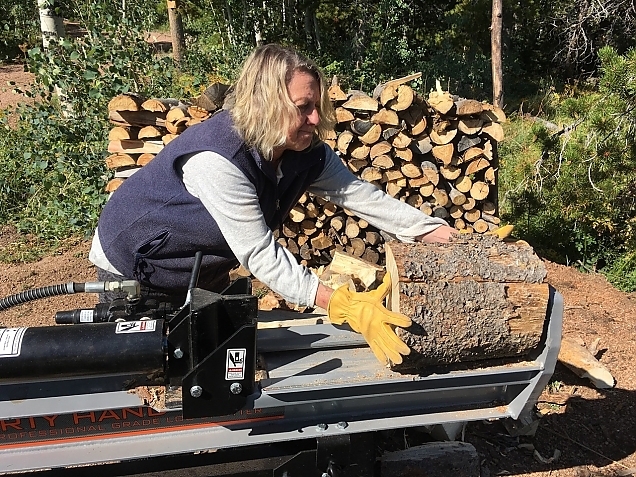 But there is something very satisfying about working with wood and knowing that all your hard work now will pay off in the winter when you are sitting around a toasty wood fire nodding off for a nap with your book in your lap. That, and that you can stand back and look at what you've accomplished —just you and no middle man. Making use of what nature left behind. I am thinking it's a good thing and well worth the effort. Steve, my decorative wood hoarding is kind of like the things you “rescue” from the streets! Hi Niels, welcome to our blog. Next entry: How Do We Like Living Here So Far?